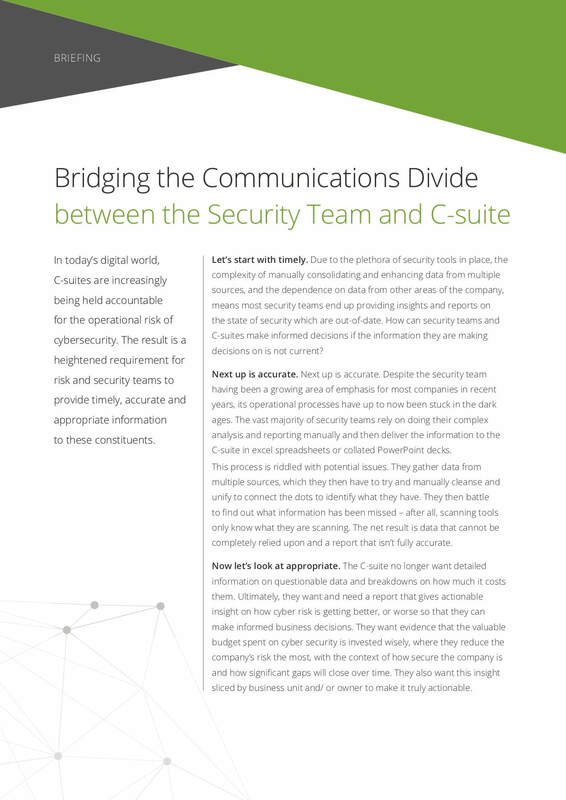 The C-suite ultimately expects three things from the Security team: a report that gives actionable information on how to reduce cyber risks, evidence that the cyber security budget is invested wisely, and appropriate insight sliced by business unit and/or owner. Negotiating through these three requirements is no small task. By following these 4 guiding principles, Security teams can help C-suite make informed business decisions to ensure the entire company is appropriately prioritising security initiatives: producing data that can be trusted, aligning cyber and business risk, demonstrating value of security projects and effectively using security data to reduce risk. In today’s digital world, C-suites are increasingly being held accountable for the operational risk of cybersecurity. The result is a heightened requirement for risk and security teams to provide timely, accurate and appropriate information to these constituents. Due to the plethora of security tools in place, the complexity of manually consolidating and enhancing data from multiple sources, and the dependence on data from other areas of the company, means most security teams end up providing insights and reports on the state of security which are out-of-date. How can security teams and C-suites make informed decisions if the information they are making decisions on is not current? Despite the security team having been a growing area of emphasis for most companies in recent years, its operational processes have up to now been stuck in the dark ages. The vast majority of security teams rely on doing their complex analysis and reporting manually and then deliver the information to the C-suite in excel spreadsheets or collated PowerPoint decks.